Sakurajima (Kyushu, Japan): Vulcanian-type explosions, which presented a spectacular show during much of the past year, are again becoming more frequent at the volcano, with now averaging one event per day. This is still very low compared to most of last year, but a significant increase compared to the past 3 weeks when there were almost none. Sinabung (Sumatra, Indonesia): Activity remains elevated although pyroclastic flows seem to have become less frequent over the past 24 hours. Popocatépetl (Central Mexico): The volcano's activity, essentially unchanged over the past weeks, has returned to very low levels, with usually less than 5 weak explosive emissions per day. Crater glow remains visible at night, indicating continuing slow lava extrusion. Santa María / Santiaguito (Guatemala): The effusion of blocky lava from the deom has become weaker, evidenced by some avalanches from the southern and southeastern rims. Explosive activity seems in turn to be picking up. On average 2-3 explosions per hour are seen from the Caliente lava dome with ash plumes rising up to 800 m and often causing light ash fall in areas to the southwest. Pacaya (Guatemala): The lava flow from the southern fissure vent at the base of Mackenney crater remains active, and weak strombolian activity occurs at the summit vent. Fuego (Guatemala): No changes in the explosive and effusive activity at the volcano occurred. 13 explosions were observed during the past 24 hours (11 weak and 2 moderate ones) with ash plumes rising up to 800 m above the crater and forming a plume 8 kilometers to the south and southwest. Incandescent material was seen rising to 75-125 m and locomotive-like degassing sounds, as well as shock waves were noted. The lava flow on the upper SE flank remained moderately alimented and was 300 m long yesterday morning. El Misti (Peru): The volcano experienced an earthquake swarm during 14-15 January, IGP reported in its latest bulletin. An increase of approx. 25% in seismic activity overall with respect to last year's average was calculated, but IGP stresses that this activity is still low and does not suggest new activity in a near future. According to the report, a total of 418 seismic events were recorded during the first half of January, most of them during the swarm that occurred on 14-15 Jan when almost 120 quakes were registered within 17 hours. From these events, 144 were so called long-period quakes (internal fluid movements), 269 volcano-tectonic earthquakes (internal rock fracturing) and 5 short pulses of tremor (internal vibration). El Misti, which is only 17 km from the center of Arequipa city, is one of the countries major and most active volcanoes. Due to its closeness to a large city and its history of explosive eruptions, it is also one of the most dangerous volcanoes in South America, and clearly one that deserves being closely monitored. Puyehue-Cordón Caulle (Central Chile and Argentina): A small emission of gas and some ash was reported by Buenos Aires VAAC. In fact, a diluted plume of gas, steam, and possibly some volcanic ash is visible on satellite images from yesterday and this morning. However, the ash if present might have been picked up by winds. It is unclear whether the volcano has actually erupted and new ash. 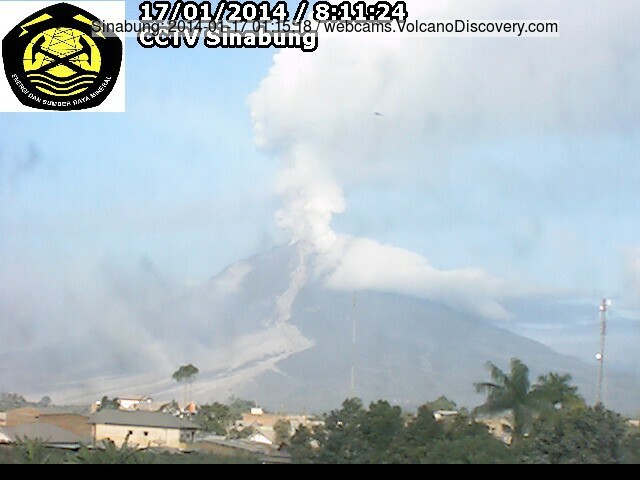 SERNAGEOMIN has not reported any unusual activity and keeps the volcano's status at green (normal).